Motorhomes, boats, travel trailers, motorcycles, and RVs. Get competitive rates with flexible terms for your new or used RV, watercraft, trailer, dirt bike, or ATV. With financing up to 100% of the vehicle cost, there’s no reason to delay your next adventure. 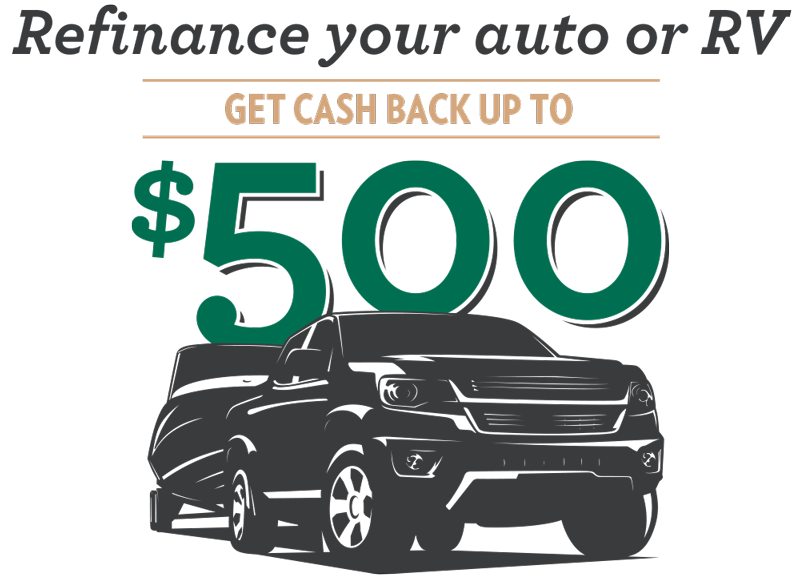 Swap your RV loan and save up to $500 when you refinance with us. *The 2% discount will be applied to the interest rate and will only be offered on loans that meet credit union underwriting criteria. The total rate, including the Swap and Save discount and any other Members 1st discounts, is subject to the current floor rate available at m1cu.org. If Members 1st cannot beat your current vehicle loan rate by 2%, we will credit up to $500 to your credit union account based on the following loan amount tiers: $5,000-$19,999 loan receives $100, $20,000-$49,999 loan receives $200, and $50,000 loan or more receives $500. Credits may be applied up to 30 days after Members 1st funds the approved application. Credits to Members 1st accounts in excess of $600 a year will be reported as miscellaneous income for tax purposes. A current loan statement from your lender will be required during the application process. Auto loan proceeds may not be used to refinance existing Members 1st Credit Union auto loans. This offer is available for a limited time and subject to change. Enter your existing RV loan information to see how much you can save by refinancing with us. If Members 1st cannot beat your current vehicle loan rate by 2%, we will credit up to $500 to your credit union account based on the following loan amount tiers: $5,000-$19,999 receives $100, $20,000-$49,999 receives $200, and $50,000 or more receives $500. Credits may be applied up to 30 days after Members 1st funds the approved application. Credits to Members 1st accounts in excess of $600 a year will be reported as miscellaneous income for tax purposes. A current loan statement from your lender will be required during the application process. Savings and interest rate discounts are approximations. For precise savings and interest rates, speak with a loan officer. Experience the difference of a Members 1st RV loan. No down payment? No problem. Finance the full amount of your vehicle. Receive a response on your RV loan application within 24-48 hours. Have instant access to your loan account from your mobile, tablet, or desktop device. Don’t have time to visit a branch and finish your application? No problem. We’ll send forms to you to sign electronically. Find out how much you can save with no obligations, application fees, processing fees, or early payoff fees. Get the most out of your vehicle by adding protection plans to your loan with Members 1st. Wealth ProtectionChoose wealth protection for you and your family. Should you ever be injured and unable to return to work, lose your employment, utilize family leave, or suffer a fatality, you or your beneficiaries will receive loan aid including possible loan forgiveness. Better yet, this benefit can be added to your loan while not adjusting your monthly payment. Guaranteed Auto Protection (GAP)Protect yourself in the event of a total loss or theft of your vehicle. Cover the balance of your loan after an insurance payout and receive a downpayment towards a replacement recreational vehicle. GAP Advantage with Powerbuy is great for longer term loans and available for most new and used recreational vehicles. What will my vehicle payment be? Could I save money by refinancing?